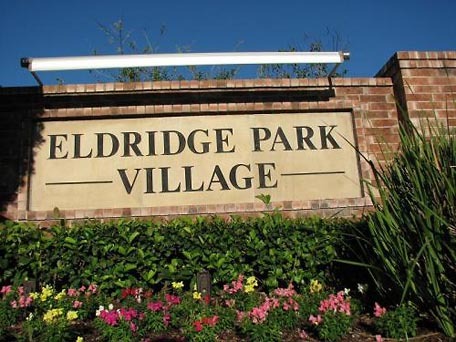 Eldridge Park Village is a beautiful, multi-cultural community with an outstanding team of volunteers who show a profound interest in every aspect of the Association. The Board of Directors works together with homeowners to ensure the needs of all are satisfied to the best of their ability. Each year the Board hosts several Community Events to celebrate the different holidays throughout the year, such as Easter, Memorial Day, Independence Day, etc., where refreshments, games, and a host of other activities are provided to the residents. In addition to a good time, these events allow for neighbors to get to know one another. The perimeter wall in the community has been badly in need of replacement for quite some time. Recently, the Board of Directors made the decision to replace the current wall with an eight foot tall Logan Stone wall along Eldridge Road. This enhancement will vastly improve the appearance and beauty of the community. Construction is underway and should be complete no later than mid-September and we are sure that all the residents will enjoy the new look to their community. We are pleased to announce Eldridge Park Village Community Association as our Community of the Month. Congratulations to the board members and volunteers for all you do!